Give your baby the soft, dry comfort of Magic Dry crib mattress protector. It is ultra thin, non quilted protector that creates and invisible layer of protection. 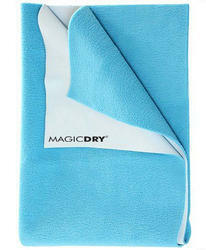 Protect your baby from allergens, dust mites, fungus and bacteria with this dry mat. It helps protect your mattress from stains. Do not expose to direct sunlight and heat. Store in dry and cool place away from moisture and humidity. Dry Sheets for babies & adults with high absorbency & laminated with a waterproof and breathable membrane. Available in widths of 60" & 80"
Looking for Baby Sheet ?